We spend so much time beating up on companies and business. It’s #fail this and #fail that. And now, there’s the PERFECT antidote. 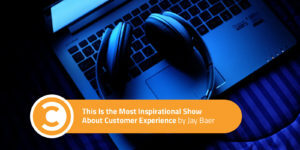 Welcome to Experience This!, where you’ll find inspiring examples of customer experience, great stories of customer service, and tips on how to make your customers love you even more. It’s the positive side of business, showing how small and large companies can delight their customers, with tips you can use to do the same. Experience This! launches today, and I would be so happy if you give the debut episodes a listen, and leave a review today. 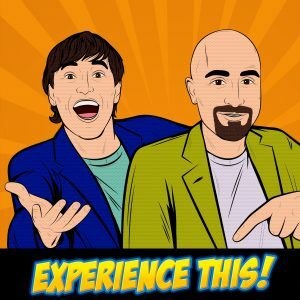 The show is always upbeat and entertaining, and it’s hosted by customer retention expert Joey Coleman and social media expert Dan Gingiss. Joey is the wacky one (his new book is going to be terrific). Dan is the wise one. He was the star of my book, and his own book is a must-read. Each episode will help you attract and keep more customers so you can grow your business, increase your profits, and have more fun in the process. In just 30 minutes, you get a fun collection of quick-hit segments filled with ideas and insights you can use. It’s got a much different format than most, and you can write in or call in with your own tales of customer experience awesomeness. It’s brisk, smart, funny, and poignant. Tons of examples from small, large, B2C, and B2B businesses in every episode. You’ll find something you can use every time! New episodes will roll out weekly, so please subscribe in your favorite podcast player to catch them all. Or, get notified by Vince, our Facebook Messenger bot, when new episodes are released. Lastly, huge thanks to our partners at Oracle CX for believing in Experience This! and becoming our underwriting sponsor. Thanks so much for your time and your trust, and I appreciate you listening to the show. Let me know what you think of it below, or in your reviews on iTunes and beyond.